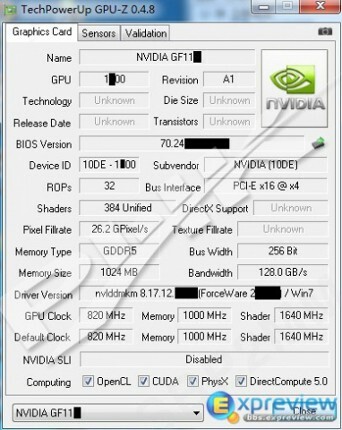 Following the launch of the GeForce GTX 580 and GTX 570, the NVIDIA rumour-mill seems to have gone quiet for a few weeks. However, we've known to expect a replacement for the excellent GTX 460 for a while, and now it looks like we might have a few more details on the upcoming mid-range powerhouse. According to a poster on the EXPReview forums the new GPU - which is expected to be codenamed GF114 - will have a base frequency of 820MHz and include 384 Cuda cores clocked at 1,640MHz. This will be paired up to a 256bit memory-interface and 1GB GDDR5 clocked to 1,000MHz for a total bandwidth of 128GB/s. The extra shaders suggest that this is a full-fat version of the GF104 with all eight 48-core streaming multiprocessors (SM) enabled instead to its predecessors seven. The core has also been given a 500-series style makeover that has allowed the clock speeds to be increased from 675MHz, 1,350MHz and 900MHz for the GPU, shaders and memory. Of course, the original chip had plenty of headroom and stock speeds of over 800MHz were pretty common once partners had a chance to work their magic, so the increase isn't all that drastic. The GF104 gave a huge boost to the Fermi architecture by delivering an aggressively priced GPU that delivered on performance without generating enough heat to fry an egg. Relatively speaking, the GF 114 is likely to be a less radical chip - especially considering how much better the current 500-series GPUs are compared to the GTX 470 and GTX 480 - but is should still provide a lot of power at a reasonable price, bolstering NVIDIA's position against AMD's recently released Barts GPUs. Obviously, though, we'll only have to wait a little longer to find out how good they actually are, since the new GPUs are expected to be released sometime in January. So basically the GTX560 was what I already predicted.So basically it will be 10% to 15% faster than an overclocked GTX460 like the EVGA GTX460 FTW. Hence it will be around the same speed as GTX470 or slightly faster in some games. Hence,like I said before the HD6870 should be competitive but can be priced cheaper due to its significantly smaller GPU and the HD6950 2GB will probably be a bit more faster but priced higher as it has a slightly larger GPU. For an incremental update?? The GTX560 is basically an overclocked GTX460 with extra shaders reactivated.